Orcinus is probably derived from Orcus, an ancient mythological Roman god of the netherworld—a reference to the ferocious reputation of this animal. Orca literally means “the shape of a barrel or cask” in Latin, likely due to the orca’s body shape. 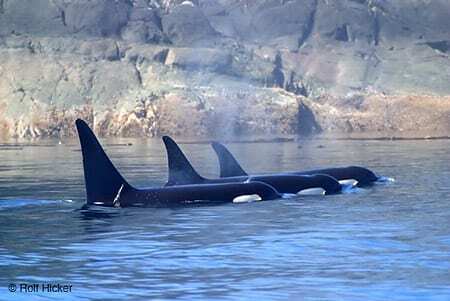 Orca are seen usually traveling in pods of between 3-25 individuals, usually including at least one large male (a male is shown in the foreground of the photo above, notice the difference in the shapes of the dorsal fins). 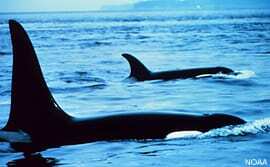 Next to humans, orcas are the most widely distributed mammal. Orcas inhabit all oceans of the world but are most numerous in the Arctic, the Antarctic and areas in nutrient-rich cold water upwellings. They have been sighted along the shores of Washington, Oregon, California, Baja California, and along the eastern coast of the United States. In addition to cold water areas, orcas have also been seen in warm water areas such as Hawaii, Australia, the Galápagos Islands, the Bahamas, and the Gulf of Mexico. Such sightings are infrequent, but they do demonstrate the orca’s ability to venture into tropical waters. Even more surprising, orcas have been seen in fresh water rivers around the world such as the Rhine, the Thames, and the Elbe. 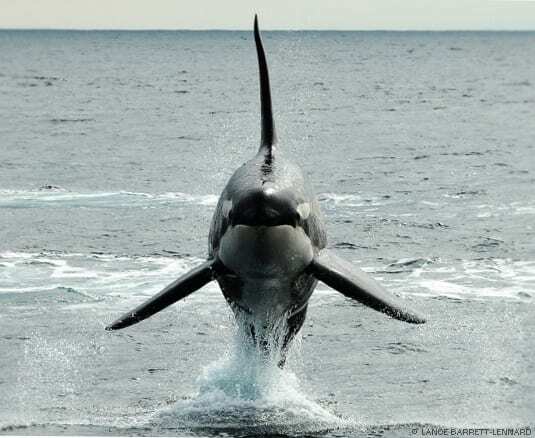 One orca was even reported to have even traveled some 177 km up the Columbia River in search of fish. Although orca can be found in both the open ocean and coastal waters, they primarily inhabit the continental shelf in waters less than 200 m deep. In cold water areas, their distribution is limited by seasonal pack ice. 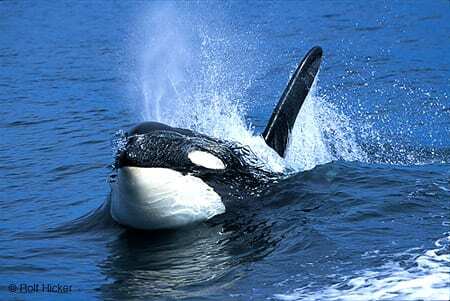 Active and opportunistic, orca are THE apex predators in the ocean. Fishes, squids, seals, sea lions, walruses, birds, sea turtles, otters, penguins, cetaceans (both mysticete and odontocete), polar bears, reptiles, and even a moose have all been found in the stomach contents of orcas. And, as their common name implies, the remains of other orcas have also been found in the stomachs of these “killer whales.” It is uncertain why these animals are cannibalistic. The diets of orcas vary from one region to another. In the Antarctic, orcas eat about 67% fishes, 27% marine mammals and 6% squid. In the Bering Sea near Alaska, they eat about 65% fishes, 20% squids and 15% marine mammals. The diets of resident and transient orcas differ as well. Resident pods eat a wide variety of fishes and rarely seek out marine mammals. Transient groups primarily eat marine mammals and occasionally eat fishes. 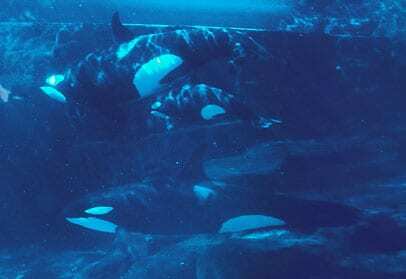 Adult orcas eat approximately 3% to 4% of their body weight in food per day; fully weaned calves can eat up to approximately 10% of their body weight during growth periods. 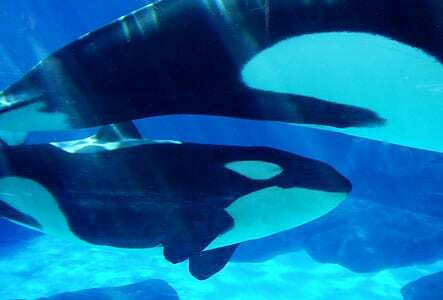 Much like packs of wolves or prides of lions, orcas often hunt cooperatively in pods for food. They work together to herd prey into a small area before attacking. When hunting a large whale, a pod of orcas may attack from several angles. Studies of orcas in marine zoological facilities suggest that females become sexually mature when they reach 4.6-4.9 m, at about 6-10 years. Males usually become sexually mature when they reach about 5.5-6 m, at about 10-13 years. Breeding may occur in any season, but it is most common in the summer. In the North Atlantic, mating seems to peak in October and November; in the western North Pacific, mating seems to be at its highest between May and June. 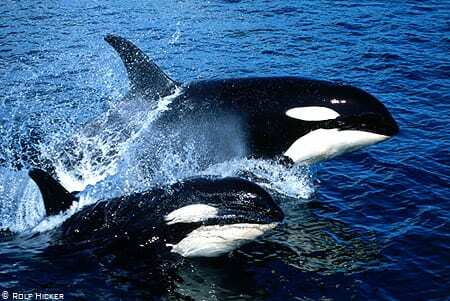 The gestation period of an orca is about 17 months—the longest known of all cetaceans. Based on limited data collected from populations at sea and in zoological facilities, a female may bear a calf every 3-5 years, although a decade may pass before some have another successful birth. Calves are born in the water. The majority of deliveries seen by humans have been tail-first births, although a head-first birth has been observed. 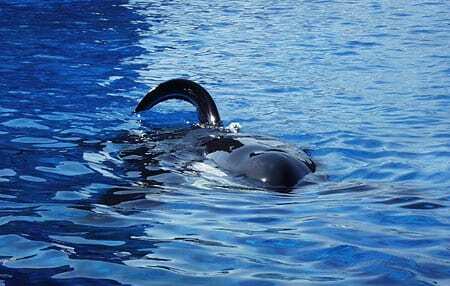 Size estimates of captive-born orcas suggest that calves average 2.6 m in length and weigh between 136-181 kg. Calves nurse below water, close to the surface. The mother glides in a horizontal position with her tail arched, and the calf swims on its side with its mouth on the right or left mammary gland. The mother’s milk is very rich so that the calf rapidly develops a thick, insulating layer of blubber. The milk fat content fluctuates as the calf develops, ranging from about 48% milk fat at the beginning of the nursing period and gradually decreasing to approximately 28% in the months that follow. A calf may nurse for 12 months or more. A calf may essentially be weaned at one year of age but may continue to nurse occasionally for several more months. No attack on a human by an orca has ever been recorded in the wild. 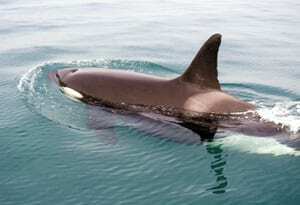 Orcas are not yet regarded as an endangered species overall. In 1946, 14 countries formed the International Whaling Commission (IWC) by signing the International Whaling Convention. The IWC set regulations of whaling to protect the future of whale stocks as a resource to humans. Currently the IWC has no jurisdiction over dolphins such as orcas. However, now that the harvest of most large whales has stopped, the IWC has expressed an interest in playing a role in managing smaller cetaceans as well.